Sometimes it pays to get personal. 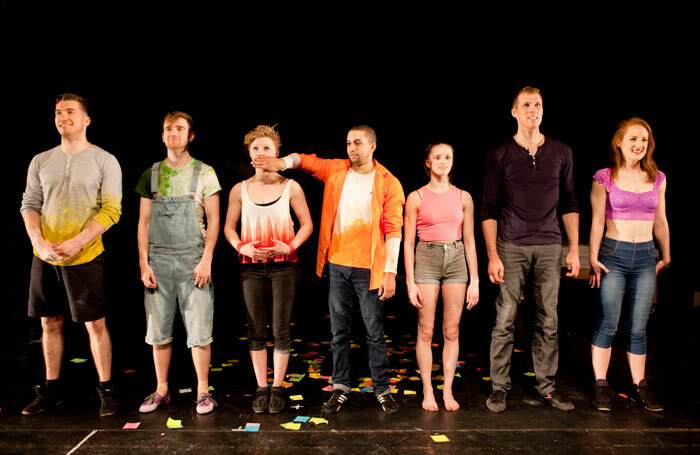 The seven members of Silver Lining circus company are infectiously honest about themselves throughout this performance. Confessions, jokes and songs are all employed in an attempt to snare the audience. It works. From the opening sequence it is clear that they are something special. In a ‘room’ decorated with hundreds of Post-It notes and a large bed, they act out aspects of their relationships with each other through circus skills, singing and just enough talking to sustain interest. The fizz and pop of their routines keep the show spinning – nearly everyone works the pole, whirling, drop-sliding and holding themselves horizontal like human flags, but they each have a speciality. Isis Clegg-Vinell and Nathan Redwood Price chart the ups and downs of their relationship through dance-driven acrobatics, including some death-defying catches. Tom Ball is the class clown, messing about inside a duvet or evoking Harold Lloyd on a specially rigged gantry as he slips, wobbles and tumbles high above the ground. The collective circus skills are assured but what really impresses is the presentation. Loaded with personality, their spring-loaded, joyful energy is as hard to resist as aerialist Lydia Harper’s dazzling smile. Whether flinging each other across the stage like frisbees or pausing to reflect on their past, they are constantly engaging, seriously attractive and occasionally moving. Super.